Many agencies and programs exist to deliver solutions. Learn more about our Partners in Conservation. Soil Conservation Districts were an outgrowth of a difficult period of our nation’s history. 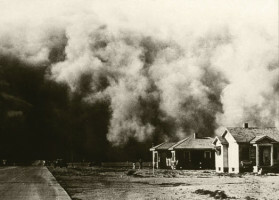 In the 1930’s, our nation experienced the greatest depression in US history along with dust storms caused by a severe and sustained drought in the Great Plains. These storms brought clouds of dust from the west to the Atlantic Seaboard and beyond. The destruction of millions of acres of land through erosion was a grave problem not only to the farms, but the nation itself. Soil Scientist Hugh Hammond Bennet was testifying on Capitol Hill about the erosion problem, when he threw back the curtains to reveal a sky blackened with dust. Congress unanimously passed legislation declaring soil and water conservation a national priority. In 1935, the Soil Conservation Service, formerly the Soil Erosion Service, was set up as a permanent agency under the United State Department of Agriculture, with the authority to work directly with landowners to apply conservation practices to the land. The Agency has now become the Natural Resources Conservation Service (NRCS). 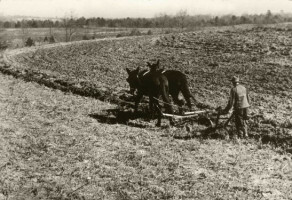 Through conservation efforts, dust bowl lands were brought back into agricultural production by World War II. In 1937, President Franklin Roosevelt wrote the governors of all states recommending legislation that would allow landowners to form soil conservation districts. Colorado enacted its law only three months later. The movement caught on across the country and the nation now boasts nearly 3,000 conservation districts dedicated to conserving our natural resources. As of 1989, almost the entire state of Colorado is included in the 76 conservation districts, encompassing some 63 million acres. While Conservation Districts are technically considered “local governments”, they fall under the statutory guidance of the State. 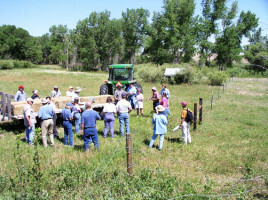 Colorado’s Conservation Districts represent private landowners’ interests in conservation planning and practices. They have led this charge since they were created by the Colorado State Legislature in 1937. In 2002, the 76 Colorado “Soil Conservation Districts” removed “Soil” from their name to more accurately reflect that emphasis not be solely concerned with soil, but for all the natural resources. Agate Soil Erosion District was established August 26, 1940, and is now called Agate Conservation District. The district encompasses a portion of Elbert, Lincoln and Arapahoe Counties for approximately 352,807 acres. The majority of the land use is rangeland. 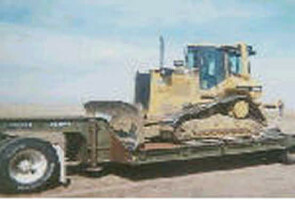 The district has provided a heavy equipment land moving service for most of it’s existence. 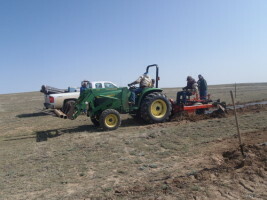 They partner with Elbert County to establish Living Snow Fences along county and state roads for public safety and protection from wind erosion. The Agate Conservation District is in the Upper South Platte Watershed. The district is governed by a board of 5 elected officials. 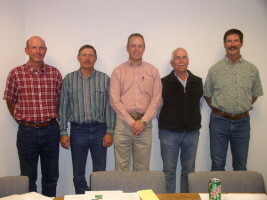 Current board supervisors (pictured): Glenn Benjamin, Edward Butler*, Casey Craven, Karli Golliher and Dawson MacLennan. *Edward Butler (1947 – 2016) Thank you for your many years of service. 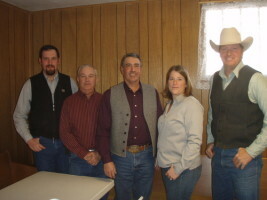 Double El Soil Conservation District was established in 1971 by a referendum to consolidate Big Sandy Soil Conservation District and Horse Rush Creek Soil Conservation Districts that were established in September 14, 1939. 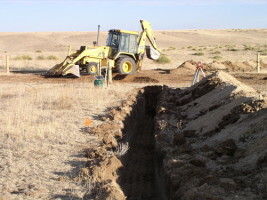 Double El Conservation District provided heavy equipment services in the 1960-1970’s. The Double El Conservation District consists of portions of Elbert, El Paso and Lincoln Counties for approximately 631,590 acres and is governed by a board of 5 elected officials. Current board supervisors are George Fosha, Dale Lucore, Ken Moore , Steve Payne and Ricky Sellers. The Double El Conservation District is in the Upper Arkansas Watershed and has a very active tree program through the Colorado State Forest Service. 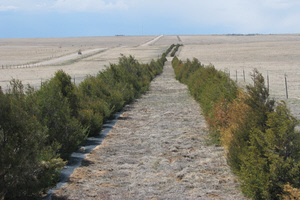 They have an active partnership with El Paso and Elbert County to establish Living Snow Fences along county roads for public safety and protection from wind erosion. In 2002, Double El constructed an office building to provide leased office space to USDA Farm Service Agency and Elbert County Simla Branch Library.